Not all motorcyclists have an insatiable fascination with the mechanics of their machine, but it pays to understand some of the basics. 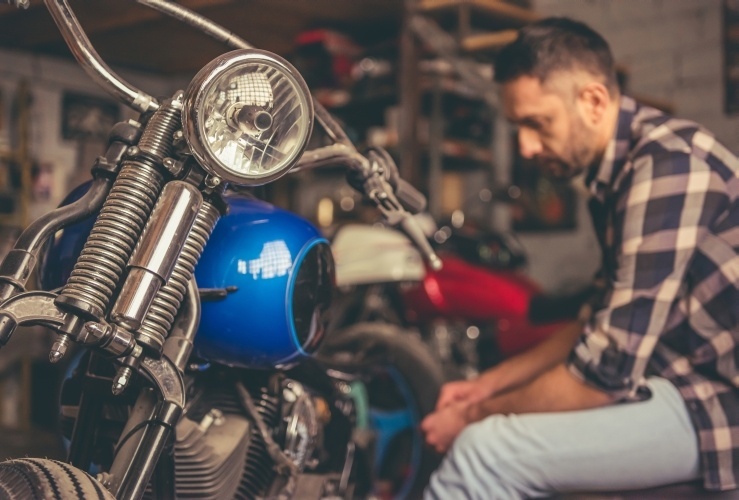 Being able to carry out key maintenance tasks on your motorcycle will help keep it in tip top condition and may even save you money in garage fees because you are able to stop issues from developing in the first instance. Rather than flying blind, it's a good idea to get hold of a workshop manual for your bike, as it will detail precisely how to approach basic maintenance tasks. It’s also prudent to invest in some high quality tools. Better tools will last you for years and will make maintenance easier. Leave the under-seat tool kit for any future roadside breakdowns. Here are 10 motorcycle maintenance tasks that you can carry out yourself. If you are unsure of any of these tasks we always recommend taking your bike to a professional. Click on the link for an in-depth look at each job. Tyre pressure – should be checked every week. Handling and braking can both be affected by under-inflated tyres. Chain tension – Avoid unnecessary sprocket and gearbox wear - not to mention transmission issues - by keeping your chain at the right tension. Battery – Keeping your battery well-maintained – and replacing it if necessary – will reduce your chances of a breakdown. Coolant level check – Not all motorcycle owners know how to check this, but being able to do so will help keep your bike in good working order. It takes just a few minutes. Change the oil – Another straight forward task, changing your oil takes minutes. Adjust and oil cables – For a smoother, more responsive motorcycle, it's worth investing in a hydraulic cable oiler. Failure to do this could impair throttle or clutch function. Change air filter – this keeps dirt and grime from getting into your bike's internal components. It needs to be cleaned routinely – and eventually replaced. Replace spark plugs – Your motorcycle will run more smoothly if a high quality set of spark plugs are fitted. Replacing old ones is a prudent step, although it shouldn’t need to be done often. Grease your bike's components – the effort will extend the life of your motorcycle’s parts and help it run more smoothly. Replace brake pads – easier than you might think, but seek assistance if you are unsure of how to do this, since properly fitted brake pads are vital for your safety.